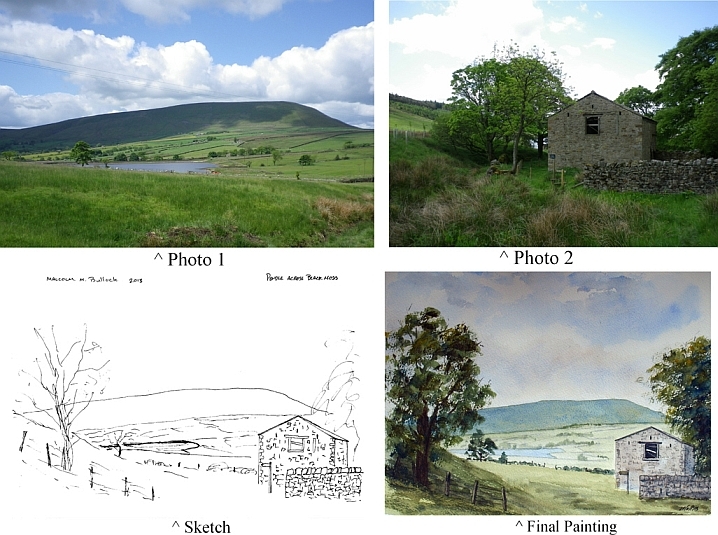 Pendle Across Black Moss - From concept to final painting. The title actually says it all – but you have to know the area to fully understand the pun. Yes it is Pendle Hill and yes it is Black Moss reservoir, Upper Black Moss to be precise. If you look at the OS map for the area you will also see many other things relating to Black Moss such as Black Moss Farm and Black Moss Road. The painting is in fact made up of two photographs, the scene does not exist in real life, and the barn in the painting is at Black Moss farm. So the title “Across Black Moss” can refer either to the reservoir or the barn or both. See how difficult is to name a painting – I should just have called it Pendle! So now for the composition - Pendle from this side can be extremely boring in a painting unless the composition is sorted. Such as a gate and track leading the eye to the hill, especially to what is known as “The Big End” of Pendle. But what I wanted was a view of the whole of the whale back of Pendle and I liked the idea of having Black Moss Res in the mid-ground to add a bit of blue. Trees either side of the painting make effective stops to prevent the eye wandering and the barn, with the stonework detailed adds a focal point which starts the eye on its journey through the painting. The photographs came from a walk done last year in June from Barley and took us first up past the outdoor centre to the top of Stang Top Moor (324m) where I got some amazing photos of Blacko Tower set against a dry stone wall (This formed the basis of a painting used at a full day workshop on watercolour technique which included painting dry stone walls – Blacko Tower was an added bonus). Then down the road a short way until the footpath is found on the left and passes through someone’s garden! This then takes you down to Black Moss farm and it is on this bit of footpath that the first photograph of Pendle was taken. The path then goes on the road a little way past the farm until you turn left and head down towards the reservoirs. The barn is just as you pass onto water authority land and this is where the second photo was taken – no views of Pendle here! The path then goes past the barn, down past both reservoirs and takes you back to Barley. A pleasant short walk for a morning or summers evening. After getting back to the car we went on to the Moorcock in Blacko for lunch – Mr Patterson does an excellent meat and onion pie, among other tasty things. The first photograph formed the basis for the shape of the hill in the distance, the hedge lines in the space between the hill and the water, the positioning of the water and the fence/hedge line in the mid-ground. So that bit of the painting is real but if we painted just that it would be pretty bland. So using the second photograph I added the barn and the tree at the left hand side. When sketching this composition it is important to retain some distinct pencil lines on the barn as this helps to give it detail. The tree that is the best one to copy is the large one on the far left of the photograph. I put a fence under it to help add a bit of interest on this side as well as scale. I put in the wall because I wanted to and it is easier to make the wall sit down rather than the barn. - Getting aerial perspective into the painting – Cooler colours at the back getting warmer as you come further forward. - Getting a little detail into the hill by carefully placing colour into the firs wet wash.
- Carefully putting the distant hedges into the mid-ground, agin while it is still wet, to get a hazy distant effect. - Being aware of the direction the light is coming from – re the shadow on the barn, the fence, the trees – it comes from the left. - Painting an effective dry stone wall. The list could go on I suppose but it is beginning to focus down a little to much and the whole idea of painting is freedom to explore. 1. Sort out the reference material that I thought I might need. In total about 4 or 5 photographs. 2. Thumbnail sketch of composition – It was actually A5 and quite a rough sketch that took less than 5 mins I expect. 3. Putting my photographs through edge detection software so I can see what the outlines look like. A very restricted pallet of colours was used for this painting - Just Ultramarine Blue, Cadmium Yellow and Burnt Sienna.